Explore the natural history and fossil record of the beautiful Oregon Coast. 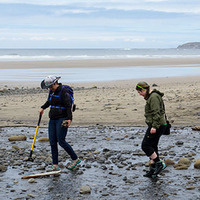 Led by MNCH paleontologist Edward B. Davis, this small-group excursion will explore the dunes in Florence and look for fossils on Beverly Beach near Newport. Wear comfortable shoes and outdoor clothing and bring a lunch. $55 per person; $45 for MNCH members. Transportation is provided. Space is limited and preregistration is required. Visit natural-history.uoregon.edu to register or learn more.